This post is dedicated to all the travelers out there. We often get inquiries about our favorite places that we have visited outside of the US. Before we forget, we wanted to leave detailed notes on our top picks in rank order. Instead of putting it as a post and making it impossibly long to scroll through, we have created a new page on the site here. You can find it in the future on the top menu of the blog. We pledge to continually update it through our travels! We have had an opportunity to visit many airports across the world. Sometimes we are surprised with how different things are! Many times the plane departure and arrival uses a corresponding bus to get you to the plane / terminal vs. a jetway. We would say this happens about 50% of the time. One negative is the stairs required to get into the plane. This can be difficult for some people. Speaking of stairs, we are surprised how many stairs are required sometimes within the terminal, especially while toting carry-on luggage. Most US airports have escalators or elevators if you have to change levels. We have found many instances where people are still up putting bags away into the overhead bins when the plane starts to taxi. This would never happen in the US. Cell phones are not supposed to be used until the plane door opens in Europe. However, in the US, its common to boot up your device, check email, text, and make calls while taxiing to the gate. It’s something we always forget living in Europe. In Europe, you don’t have to take off your shoes to go though the security x-ray. So nice! Which continent is best for connections? We advised our parents to connect in the US when they came to visit us in Europe. The pros to this advice are that the airports are usually laid out in a way that makes sense to them, as well as they can ask in English comfortably if they are confused. Contrary, European connections are a little more difficult to navigate. You have to go through immigration and out to the public area of the airport which requires you to go back through security. This can be confusing to some who aren’t used to it. The bus factor above can add stress to connections because you have to board a bus to get to the terminal and board a bus to get to your next plane. You also want to think about where you’d rather be stuck. We generally like to take the longer flight first. Thus, if you are late, you are at least on the same continent you are supposed to be on, rather than getting stuck another day for the next International flight. When landing in Europe from the US, you don’t have to take your bags with you through immigration. Just yourself. When landing in the US from Europe, you have to go through immigration, claim your bags, and go through customs with the bags. You then have to re-check them if you aren’t at your final destination. I love IAD / Washington Dulles. There is a direct flight from Geneva so it is my favorite. It might help that I grew up in Virginia so it is close to home. We really like GVA / Geneva too. It is small so you don’t have to get there so early. Its tiny size also makes it easy to pick guests up. Plus, the city gives out a free 80 minute public transportation ticket to anyone flying into Geneva. We just flew out of ATL / Atlanta International. What a difference they have made – a shiny new terminal just for international flights. The staff is friendly, lines short, and the food course is awesome. Before this, I would have put ATL down below into the Worst Airports for International flights due to their old method of making you go back through security and take the train to baggage claim, even if it was your final destination. This wasted on average 45 minutes to an hour for the international traveler. Kudos for changing this, ATL. HER / Crete – Heraklion – Check in is done by flight, not airline. So each destination city has an individual desk. You are not allowed to check-in until 2 hours before your flight, when the check in desk # is posted on the screen. We arrived 3 hours early, so we had to sit in absolute hot & steamy Greek chaos to wait until we checked in and got into a mad rush of people all arriving at the same time – a line about 30 deep. However, we ended up in the wrong line because we went for the line saying Geneva. Who knew there could be another flight to Geneva 15 minutes later on a different airline? We got to our plane just in time for our flight which is ridiculous for getting their so early. Again, something solved by going to an airline desk vs. city desk. GIG / Rio de Janeiro – again, you couldn’t check in until 2 hours before. I don’t understand why these airports are so against people checking in early. Our flight time was supposed to be 7:16am. Upon arrival, the board said 7:53am. Maybe its late?? The flight didn’t open for check in until 5:53am. All which wasn’t clear at all, just a guessing game to just get in line. Luckily it was the right line. But after asking if we’d miss our connection with the flight time push back, the clerk said the flight time was 7:16am, not 7:53am, we’d be fine to make our connection. But my boarding pass said 7:53am. And they started boarding the domestic plane at 6:16am. Bizarre. And also weird that they only allowed for 23 minutes to get from the check in counter, through security and to the gate. 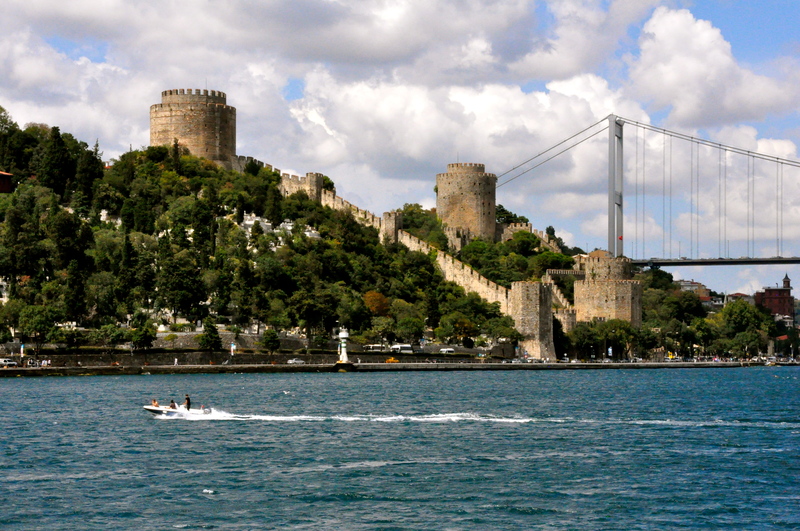 IST / Istanbul – you have to go through the full metal detectors and security check to even get to the check in desks. So this security process is required twice for travelers flying. One for people picking up people. Awesome. Love doing it twice. Especially love the thrill of being late for an early a.m. flight not knowing this. 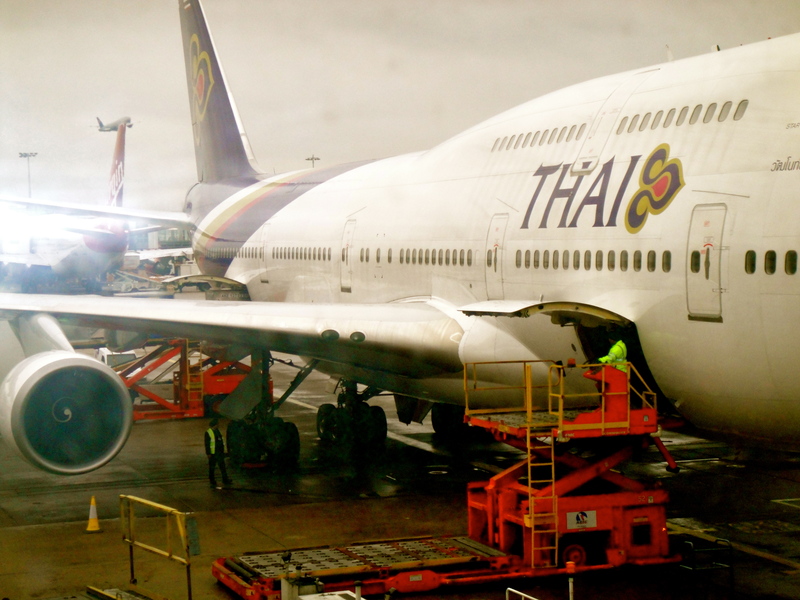 BKK / Bangkok – We had such a debacle with Bangkok Airlines when flying to Cambodia. We showed up 2 hours early for a 7am flight but they said that they sold our seats because we were too late. We got booted to the next one and missed our tour that day. Note: never take Bangkok Air if you can help it! LHR / London Heathrow – Every time we go through here, we have issues. Either me with my visa or Gabe with his refusal to use a plastic bag or his iPad. They are not fans of us. FRA / Frankfort – It’s sheer size makes it hard to make connections. An hour layover? Forget about it. I got stuck in Europe after missing my plane with a full hour layover. Not enough! Also, wear your walking shoes if you are connecting in this monster! JFK / New York– I had a 2.5 hour connection and barely made it….talking running. They need to hire more immigration officers to help speed up the line. I sat for over an hour in the immigration line. The line for non US citizens was 10 times longer. I don’t think those people had a prayer of making it out of the line that day. Also, at JFK, you have to sometimes walk between terminals to get to connecting flights. Make that RUN after you have spent over an hour in immigration…. Do you have any favorite or least favorite airports? 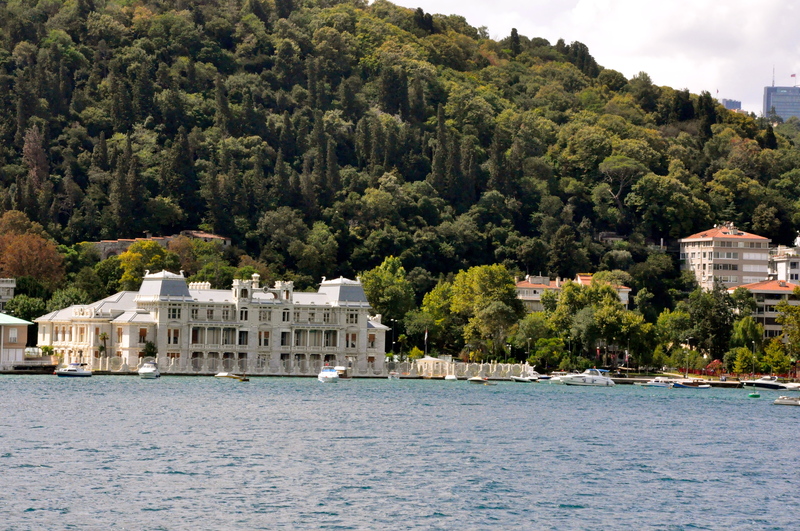 On Sunday, after the Blue Mosque, we headed down to Eminou port and caught a Bosphorus tour. 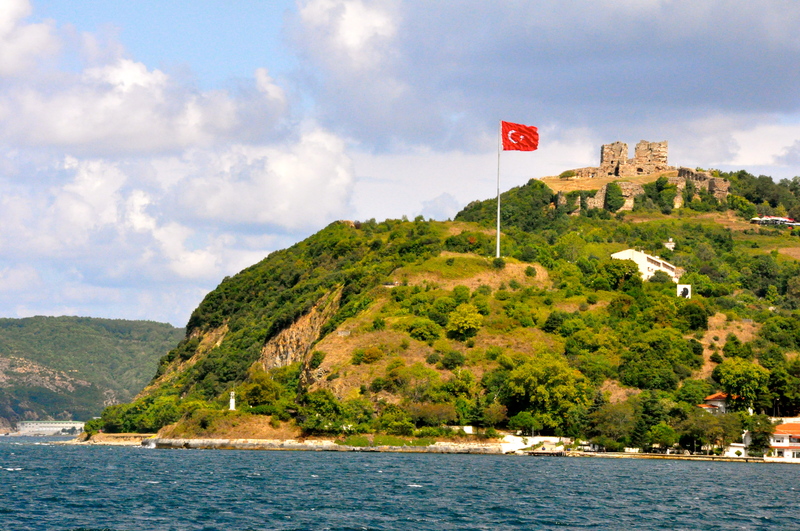 There are countless tour operations, and even more guys in the street trying to lure you in chanting “Bosphorus Tour….Bosphourus Tour…..Bosphorus Tour”. 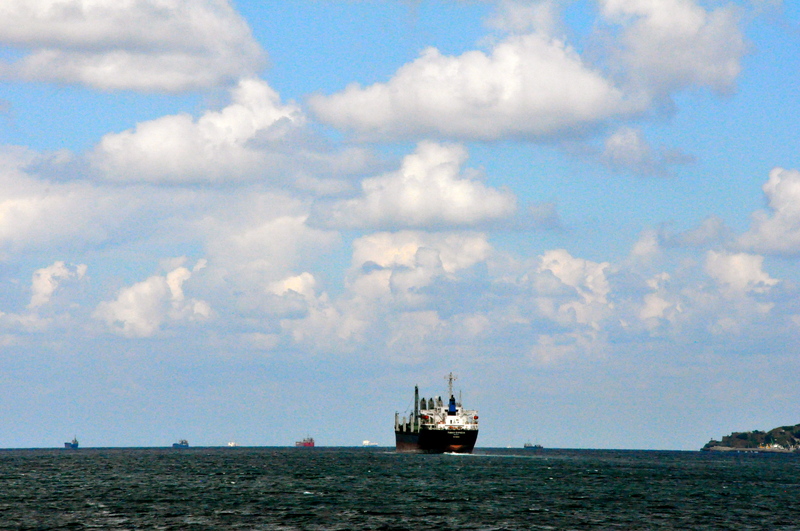 However, we had read about one particular company that offered a service of hopping on and off on opposite coastlines. 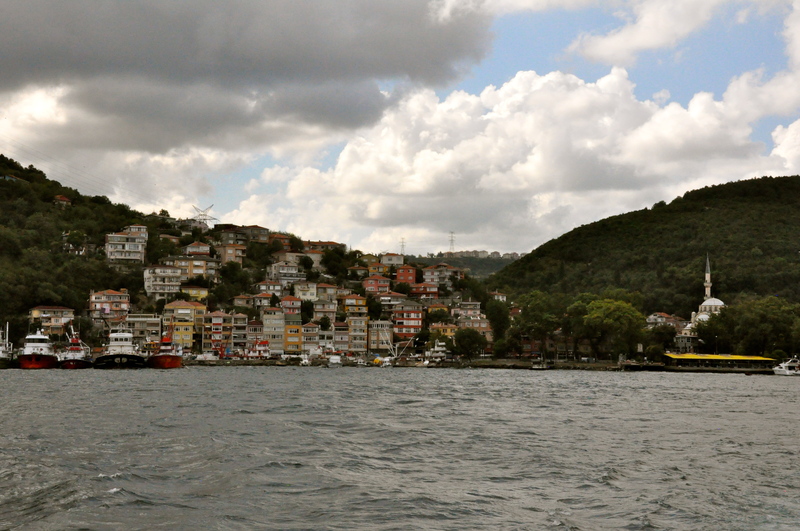 This was really appealing to us, since the Bosphorus strait is the separation between Europe and Asia. We thought it would be neat to have lunch in Asia. For reference, this company has three departures a day – 10:35, 12:00 and 1:35. Also a tip for European travelers, make sure your watch is set to the appropriate time zone. We bought tickets thinking our boat left in 30 minutes. However, we were on Swiss time. An hour and a half wait. Oops. We had a snack (bread ring for me, fish sandwich for Gabe) on the bridge, waiting to set sail. It was a really nice way to spend the afternoon. 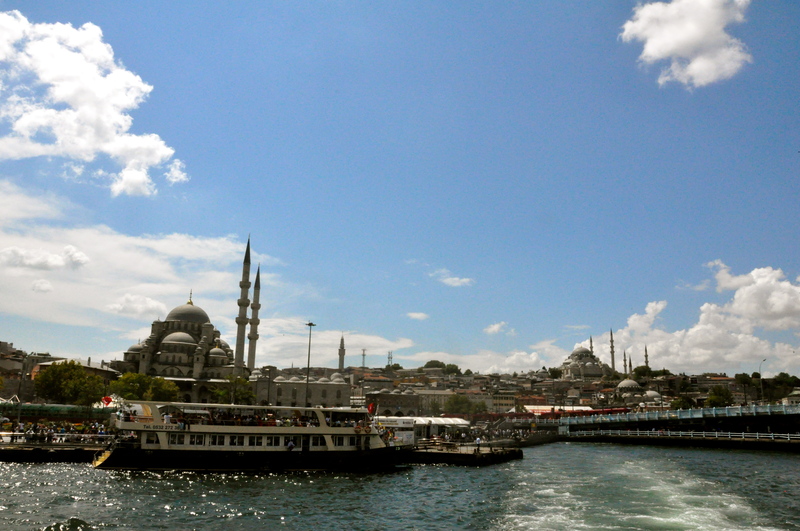 Since hoards of crowds were out, happily dining in the daylight after Ramadan, the peacefulness of the boat was a plus. 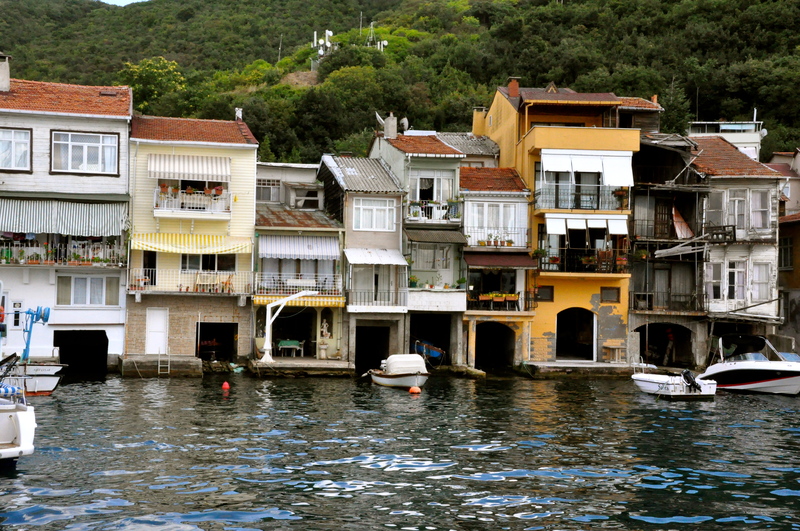 After a two hour ride, we docked in Anadolu Kavagi and selected a restaurant based on the smell of the delicious fish we saw grilling on the side of the building. They said a fresh fish would take 15 minutes, no problem with the timing. So, we had some mezes to bide the time. However, after about 30 minutes, we were getting nervous having time to eat and catching our return boat. 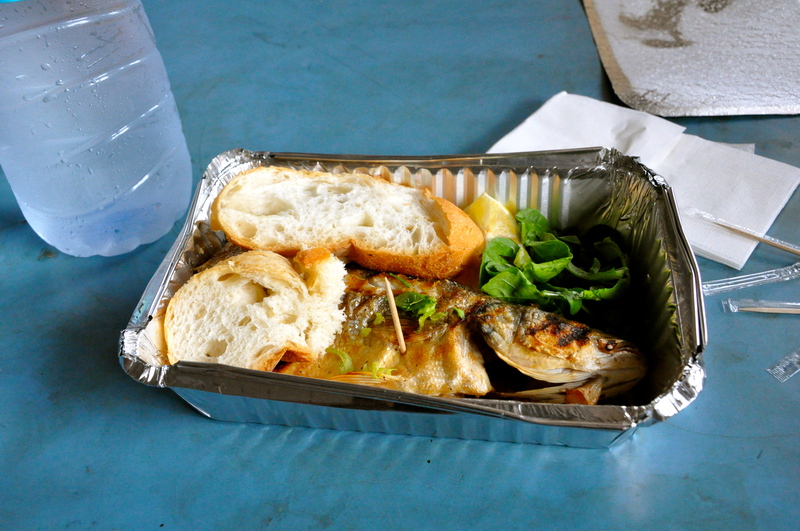 It all went a little downhill from there, but let’s just leave it at I got a whole fish in a aluminum tin “to go”. Entertaining, but it made for a fun rest of the trip home, trying to eat this with the toothpicks I swiped from the restaurant. This post would have been more interesting had I not picked up a little friend* in Cambodia who dwelled in my tummy during our last stop, Bangkok. I finally made it out of our hotel at 5pm one day and 2pm the next, so a few of our plans in this great city didn’t come to fruition. Luckily, we’d had a little unexpected time earlier in the week when our connection to Cambodia ran into a snafu. We showed up at the airport at 6am for our 8am flight. We were told by Bangkok Airways, “Oh, the plane is already full. You catch next flight…2pm” After much back and forth, explaining how we had a full day in Cambodia already planned a tour paid for and showed receipt of confirmed seats, we still didn’t have any luck**. They gave us a free hotel room, but we decided to use the time instead to get an early view of Bangkok. We hopped in a taxi to the Royal Palace. While we still did miss part of our itinerary in Cambodia, this time to see a bit of Bangkok was a blessing in disguise because of how awful I felt later when we returned. Not sure it could have happened then. 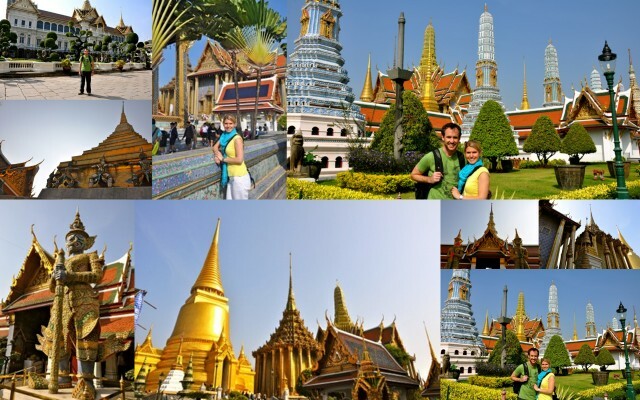 As mentioned above, our return trip to Bangkok was limited in sightseeing. However, we did manage to catch a drink at SkyBar, Gabe experienced some Bangkok nightlife after I turned in, and we hit the huge Saturday market, Jatujak. 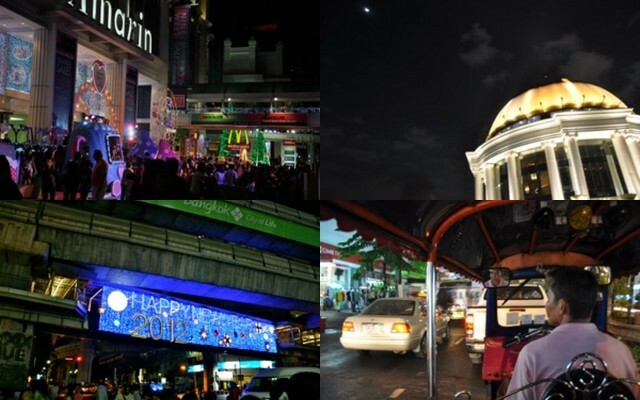 And, we got to see how the Thai ring in the New Year with lots of color and liveliness. A bonus was seeing the fireworks from all sides of the plane as we took off at 12 midnight on New Years Eve. We’ll just have to come back to Bangkok to get to see all the things we missed! *We suspect my food illness was actually from our 5-star hotel, not actually local food in Cambodia so don’t let this turn you off. **Bangkok Air entitles itself the “Asia’s Boutique Airline”. Don’t believe it. This is the worst run airline operation we have ever seen. After having one of our legs “full” at check-in and the other return flight 4 hours late (no weather issues), we were not fans of this “boutique”. 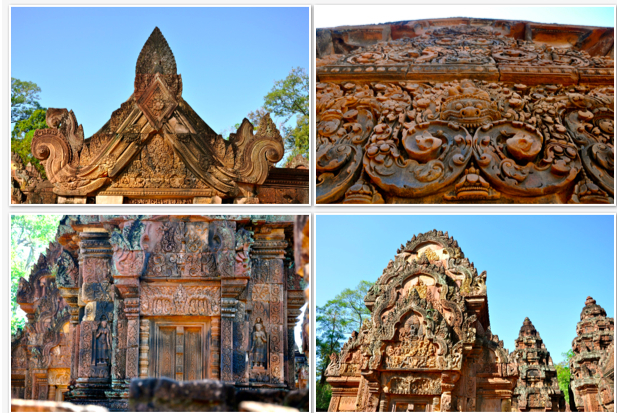 On the other hand, Thai Air was A-M-A-Z-I-N-G.
As we mentioned in the previous post, we were shocked how many ruins there were in the Angkor region….about a thousand! 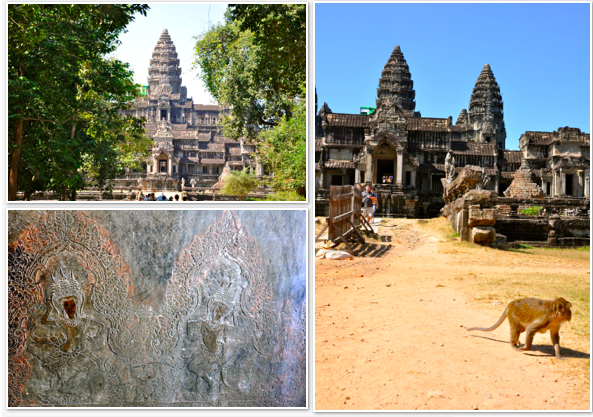 That was such a surprise for us as we were thinking it would just be the one…Angkor Wat. 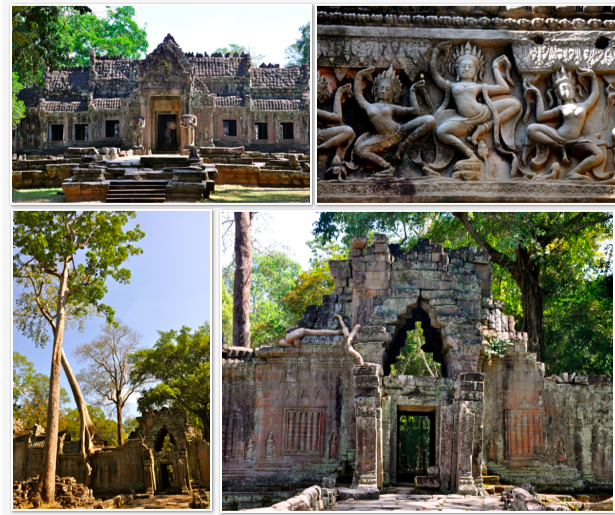 However, Angkor Thom ( Angkor = “city” and Thom = “big” ) had so many amazing sites within its four walls. Not to mention, its four walls were adorned with detail, 2 miles each. Crazy! There were also a lot of sites just outside the deep moat surrounding the walled city. To top it off, the most magnificent, Angkor Wat, was constructed during the height of the Khmer empire and is said to be the world’s largest single religious monument. One of the other takeaways we had was how the temples “changed hands” throughout history. They changed back and forth from Hindu to Buddhist depending on the king at that time. I’m a little embarrassed to admit this, but the only thing that I knew about Cambodia prior to this year was that it was the country from which Angelina Jolie adopted her son. 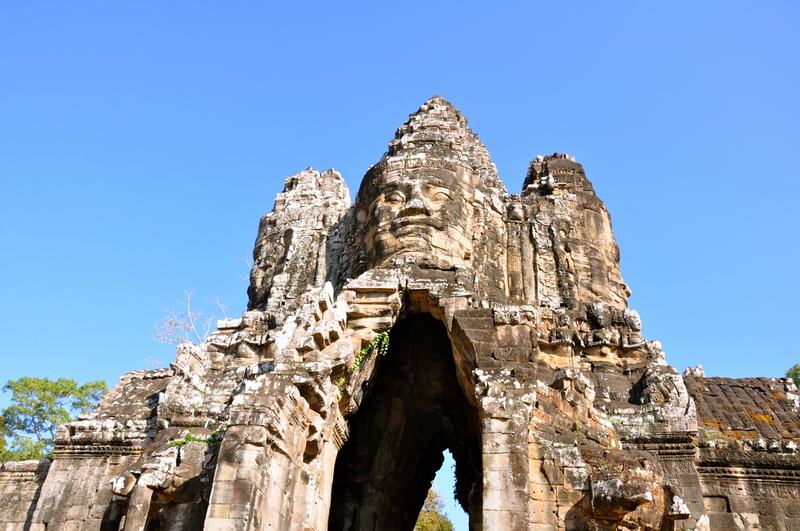 Cambodia had been on Gabe’s list for the lure of the ancient temples. 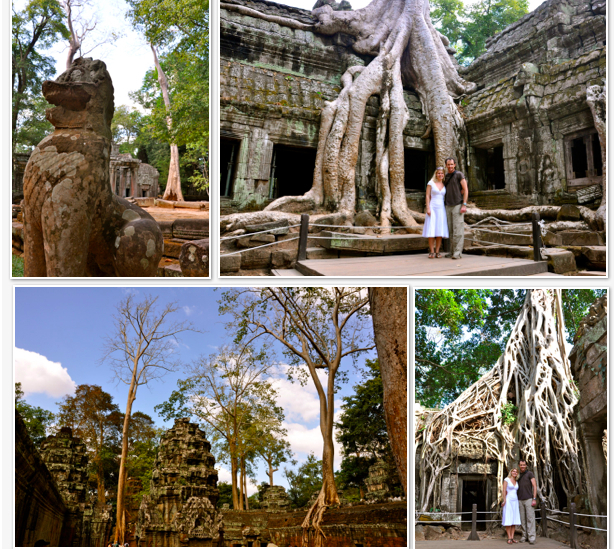 So, we decided to venture there during our Southeast Asia trip since it was an easy add on. 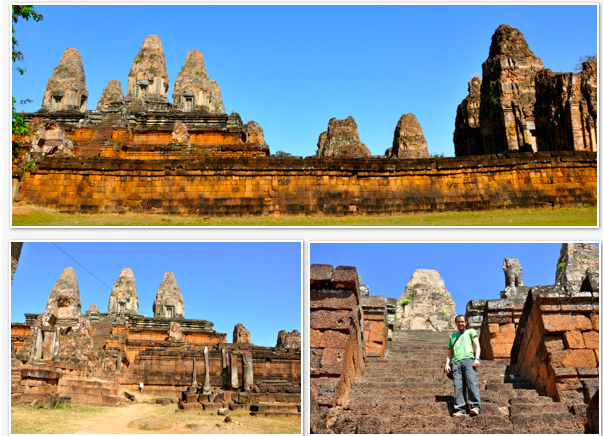 After three days spent exploring Siam Reap, Angkor, and the central Cambodia region, I am now in wonder. 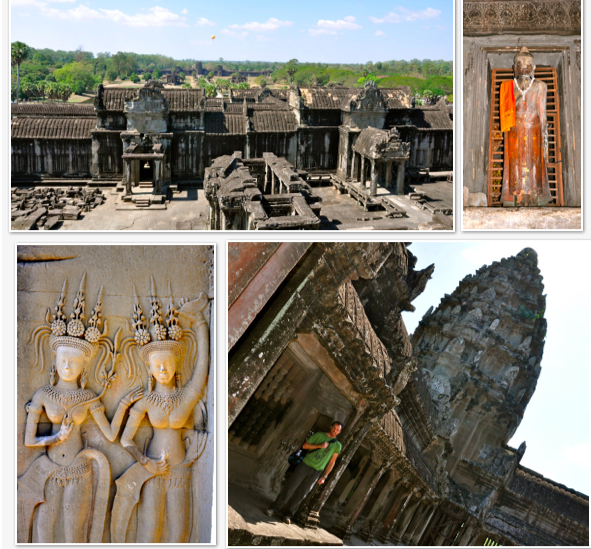 -Angkor Wat is the famous temple & name for which Cambodia is known; however, there are hundreds of ruins and dozens of temples in this region of the world from the Khmer Empire. So, its not just one site like we’d originally thought. -They take US dollars more frequently than their currency. Everything we saw except gas was in US currency. And it was crazy cheap – $5 for a one hour massage. The exchange rate for their currency is about 4000: 1 USD if you are baffled by the price on the gas sign! I bring my nephew our loose change from our travels. I actually have about 8000 in mixed bills for him from Cambodia…can’t wait to see his face. -This country has come an amazingly long way. 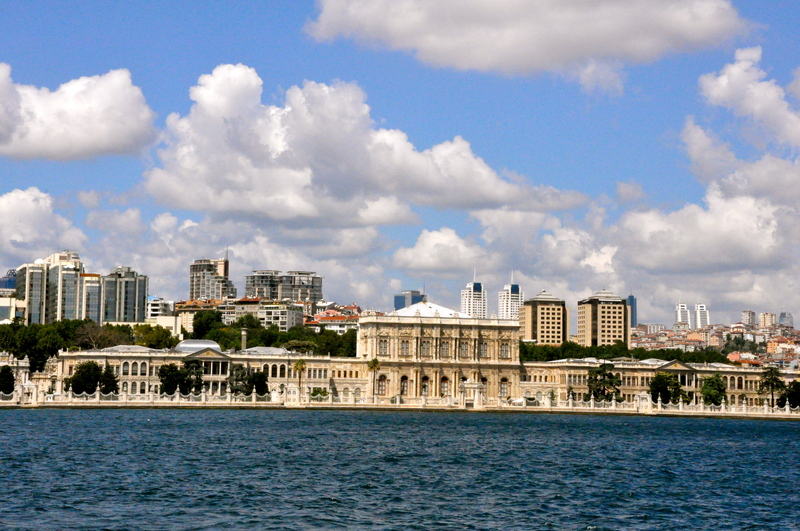 Twenty years ago it was war torn and very dangerous. During this post-Vietnam war Khmer Rouge regime, 2 million, or one-third of Cambodians were killed as a result of genocide. Thankfully, the country is now at peace. 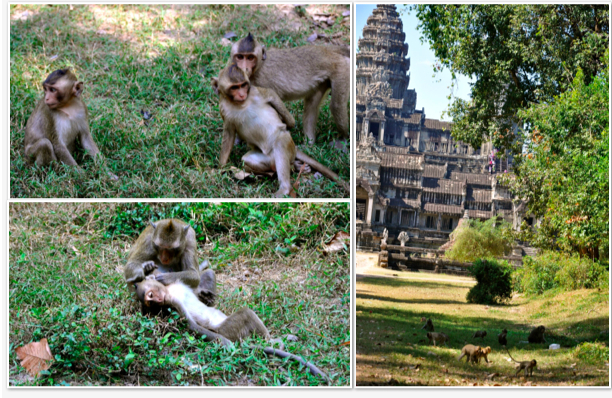 Now that it is much safer, the above two factors (Angkor ruins & low-cost of living/travel) have seen a blooming tourism faction, helping to stimulate the economy and create jobs for Cambodians. Please see “Killing Fields” for more history & awareness on these awful events. -The presence of French. French was everywhere! We were able to practice our Bonjour Madame and Bonsoir Monsieur’s at the hotel. We learned that France, at one point, ruled over Cambodia when it was a part of French Indochina. -Don’t mess with Angelina. I’m not her biggest fan based on some odd behavior and the whole Brad/Jennifer deal, but when conversing with our driver, I quickly learned not to say anything too harmful. She is well renowned for her humanitarian work as well as adopting one of the country’s orphans ( Maddox ) while filming Lora Croft: Tomb Raider. I can easily see how Cambodia captured her heart and have a newfound respect for what she has done here. This country needs support badly. 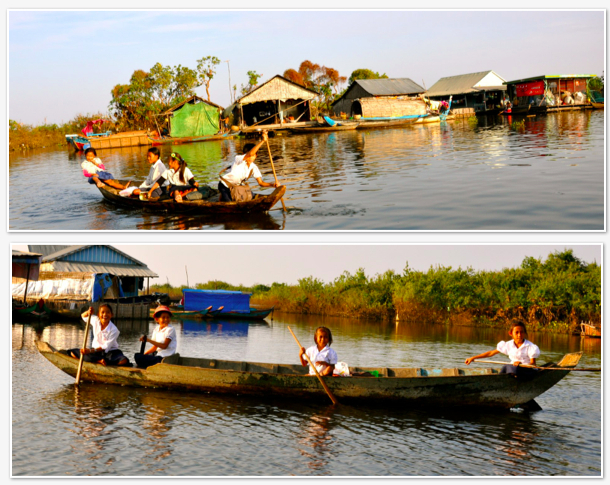 On our first day, we took a small boat to a floating fishing village on the Tonlé Sap lake to see the local way of life. The children were just getting out of school and paddling their canoes back to their watery abodes. 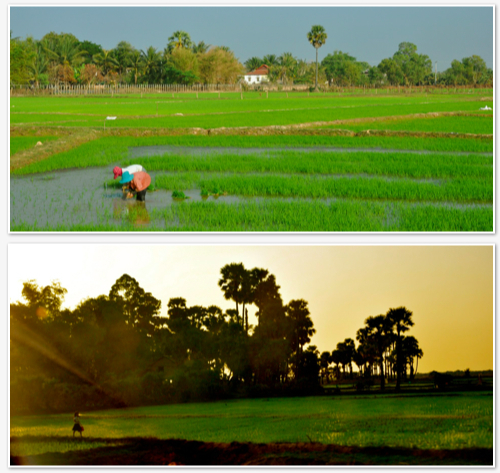 80% of Cambodians are farmers, with rice being the most prominent crop. I love the below photo of the little girl walking home from school. 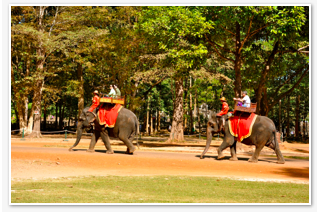 Tuk-tuk was the most common way to get around. Otherwise, elephant. The ruins are on the edge of the Cambodian jungle. Thus, lots of monkeys to my delight. We saw a momma monkey caring for a baby monkey. 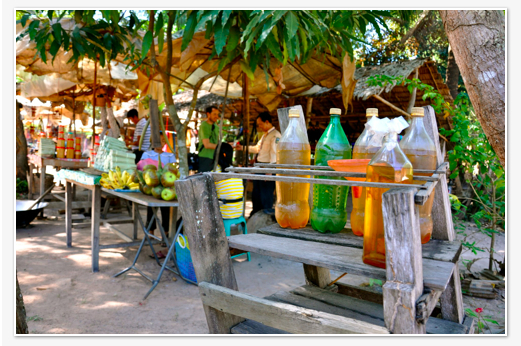 Also along all the streets were markets selling food and souvenirs. This is palm juice being made into sugar and juice. Yup, my husband drank some of this juice out of the wall plaster bucket. Me, no way.